In a game with more storylines than what can be counted with fingers, the Fayetteville Woodpeckers needed 12 innings to knock off the Frederick Keys in the series opener on Monday in Maryland, 8-5. The Woodpeckers only collected six hits in the contest and benefited from a depleted Frederick bullpen that still required four relievers to complete the game. Peter Solomon was outstanding in his season debut. While the right-hander did surrender a two-run home run in the first inning, he eventually set a new career mark by striking out 11 Keys in just under five innings of work. Meanwhile, however, Cody Sedlock was just as efficient in his debut, striking out six batters and not surrendering a hit through the first four innings. In the fifth, Colton Shaver was able to break the offensive slump, and knocked a solo home run over the left field wall for his first of the season. Sedlock eventually allowed the tying run to score in the sixth on an RBI single by Seth Beer. Beer was 2-for-6 at the end of the lengthy contest with an extra RBI in the final inning, his third and fourth RBIs on the season. Each team plated their free runner in the tenth inning, and each team came up empty in the eleventh. 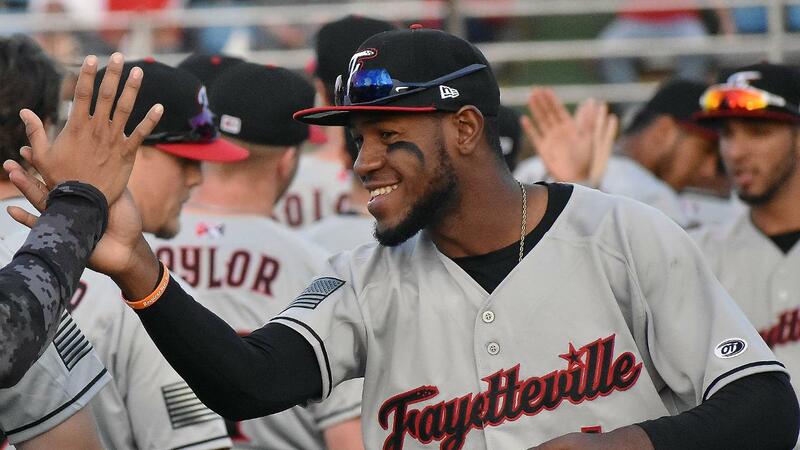 In the twelfth inning, Fayetteville drew back-to-back walks to load the bases with no outs, but a force out at home and a strikeout set worry that it might be wasted. Jacob Meyers delivered again for the Woodpeckers, drawing a bases loaded walk on six pitches, and Corey Julks followed with a two-RBI single to push Fayetteville ahead for good. The game set a few early season records for the franchise. It stands as the longest game in team history at 4:15 and at 12 innings, while the Woodpeckers struck out 20 times at the plate and struck out Frederick batters 19 times. The Woodpeckers will have a chance to win their first series in franchise history when they play the second game of the series tomorrow at 7:00. Bryan Abreu, a member of the Houston 40-Man Roster, will make his 2019 debut as he faces right-hander Brenan Hanifee.